Zigo. Single @ $1350 for 3 speed and double at $1399 for 3 speed. More for new 7 speed. 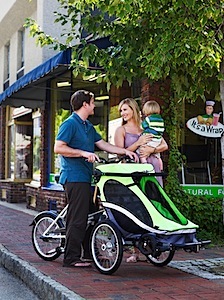 Allows you to bike your kids to school or market and detach bike to use the “child pod” alone. Ready to go out of box.